Reading and share top 21 famous quotes and sayings about Lisbon by famous authors and people. Browse top 21 famous quotes and sayings about Lisbon by most favorite authors. 1. "I think that the EU with the Lisbon agenda has put the right emphasis on growth and employment." 2. "So-called real life has only once interfered with me, and it had been a far cry from what the words, lines, books had prepared me for. Fate had to do with blind seers, oracles, choruses announcing death, not with panting next to the refrigerator, fumbling with condoms, waiting in a Honda parked round the corner and surreptitious encounters in a Lisbon hotel. Only the written word exists, everything one must do oneself is without form, subject to contingency without rhyme or reason. It takes too long. And if it ends badly the metre isn't right, and there's no way to cross things out." 3. "A long time ago I lived in Lisbon,' she said, in softly slurred Portuguese that made the name of the city Leesh-boa. 'But before that, meus neto, my tribe was in the mountains where there are only old things, like the trees and the rocks and the streams. There are truths to be learned from the old things -' She hesitated, and her brown, shrunken claw closed over Pete's hand. 'Do you know the truth, Pedrinho? '("Before I Wake...")"
4. "Let's say I will rip your life apart. Me and my banker friends. How can he explain that to him? The world is not run from where he thinks. Not from border fortresses, not even from Whitehall. The world is run from Antwerp, from Florence, from places he has never imagined; from Lisbon, from where the ships with sails of silk drift west and are burned up in the sun. Not from the castle walls, but from counting houses, not be the call of the bugle, but by the click of the abacus, not by the grate and click of the mechanism of the gun but by the scrape of the pen on the page of the promissory note that pays for the gun and the gunsmith and the powder and shot." 5. "With most people suicide is like Russian roulette. Only one chamber has a bullet. With the Lisbon girls, the gun was loaded.One bullet for family abuse.One bullet for genetic predisposition.One bullet for historical malaise.One bullet for inevitable momentum.The two other bullets are impossible to name, but that doesn´t mean the chambers were empty." 6. 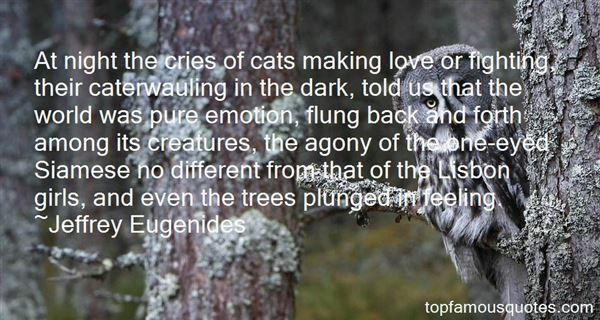 "At night the cries of cats making love or fighting, their caterwauling in the dark, told us that the world was pure emotion, flung back and forth among its creatures, the agony of the one-eyed Siamese no different from that of the Lisbon girls, and even the trees plunged in feeling." 7. "We all received invitations, made by hand from construction paper, with balloons containing our names in Magic Marker. Our amazement at being formally invited to a house we had only visited in our bathroom fantasies was so great that we had to compare one another's invitations before we believed it. It was thrilling to know that the Lisbon girls knew our names, that their delicate vocal cords had pronounced their syllables, and that they meant something in their lives. They had had to labor over proper spellings and to check our addresses in the phone book or by the metal numbers nailed to the trees." 8. "Mr. Lisbon knew his parental and neighborly duty entailed putting the retainer in a Ziploc bag, calling the Kriegers, and telling them their expensive orthodontal device was in safe keeping. Acts like theses -- simple, humane, conscientious, forgiving -- held life together. Only a few days earlier he would have been able to perform them. But now he took the retainer and dropped it in the toiler. He pressed the handle. The retainer, jostled int he surge, disappeared down the porcelain throat, and, when waters abated, floated triumphantly, mockingly, out, Mr. Lisbon waited for the tank to refill and flushed again, but the same thing happened. The replica of the boy's mouth clung to the white slope." 9. "They had killed themselves over our dying forests, over manatees maimed by propellers as they surfaced to drink from garden hoses; they had killed themselves at the sight of used tires stacked higher than the pyramids; they had killed themselves over the failure to find a love none of us could ever be. In the end, the tortures tearing the Lisbon girls pointed to a simple reasoned refusal to accept the world as it was handed down to them, so full of flaws." 10. "The window was still open." Mr Lisbon said. "I don't think we'd ever remembered to shut it. It was all clear to me. I knew I had to close it or else she'd go on jumping out of it forever"
11. "For the eternity that Lux Lisbon looked at him, Trip Fontaine looked back, and the love he felt at that moment, truer than all subsequent loves because it never had to survive real life, still plagued him, even now in the desert, with his looks and health wasted. 'You never know what'll set the memory off,' he told us. 'A baby's face. A bell on a cat's collar. Anything. 'They didn't exchange a single word. But in the weeks that followed, Trip spent his days wandering the halls, hoping for Lux to appear, the most naked person with clothes on he had ever seen." 12. "Mr. Lisbon had the feeling that he didn't know who she was, that children were only strangers you agreed to live with." 13. "That since Cecilia's suicide, the Lisbon's could hardly wait for the night to forget themselves in sleep"
14. "On the morning the last Lisbon daughter took her turn at suicide- it was Mary this time, and sleeping pills, like Therese- the two paramedics arrived at the house knowing exactly where the knife drawer was, and the gas oven, and the beam in the basement from which it was possible to tie a rope." 15. "I had no books at home. I started to frequent a public library in Lisbon. It was there, with no help except curiosity and the will to learn, that my taste for reading developed and was refined." 16. "They could not help loving anything that made them laugh. The Lisbon earthquake was "embarrassing to the physicists and humiliating to theologians" (Barbier). It robbed Voltaire of his optimism. In the huge waves which engulfed the town, in the chasms which opened underneath it, in volcanic flames which raged for days in the outskirts, some 50,000 people perished. But to the courtiers of Louis XV it was an enormous joke. M. de Baschi, Madame de Pompadour's brother-in-law, was French Ambassador there at the time. He saw the Spanish Ambassador killed by the arms of Spain, which toppled onto his head from the portico of his embassy; Baschi then dashed into the house and rescued his colleague's little boy whom he took, with his own family, to the country. 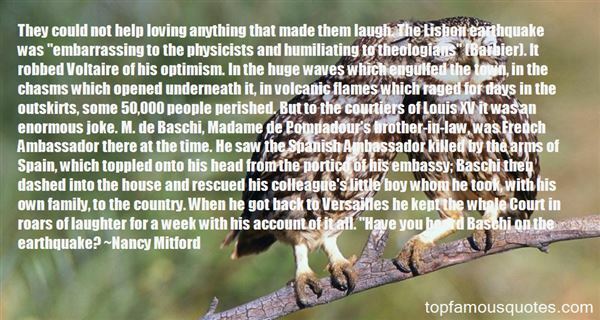 When he got back to Versailles he kept the whole Court in roars of laughter for a week with his account of it all. "Have you heard Baschi on the earthquake?" 17. "Lisbon Taxi,' a woman said, 'where the mileage is always smileage. How may we help you today?" 18. "Other than when I got the news about Mom, I can only remember one other time when I cried as an adult, and that was when I read the story of the janitor's father. 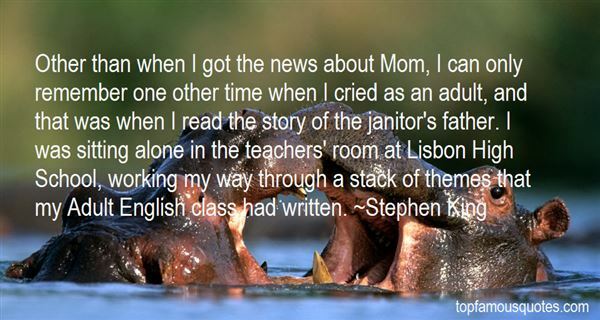 I was sitting alone in the teachers' room at Lisbon High School, working my way through a stack of themes that my Adult English class had written." 19. "But how conceive a God supremely good/ Who heaps his favours on the sons he loves,/ Yet scatters evil with as large a hand? [Written after an earthquake in Lisbon killed over 15,000 people]"
20. "It's not too late to stop the Lisbon Treaty." 21. "If we were to have a presidential election in Europe it would be an event that would spark a huge interest in people from Lisbon to Helsinki, just like national elections. And it would create a completely different political setting in Europe." As an actor all we want to do is act and play people."